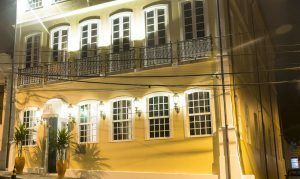 “A Casa das Portas Velhas” is located at the Historical Site of Salvador and is part of the Cultural Heritage of UNESCO. It is in Largo da Palma (Palm Place) so called for being chosen as the home of several Spanish families that came from Palma de Maiorca in other times. The place holds a dispute during the colonization period in its history when the city was taken by Spanish and Portuguese united under the same crown, in 1625. The area preserves its colonial aspect up to date because of its houses and manors and the Church of Our Lady of The Palm, a 17th century building with baroque works of important Brazilian artists in its interior, thus being an interesting cultural attraction of Salvador. The historical beauty of Largo da Palma also has picturesque attractions such as the house of Dona Flor, which was used in the film “Dona Flor e Seus Dois Maridos” (Dona Flor And Her Two Husbands), a worldwide success movie adapted from a book by the internationally famous Baiano writer Jorge Amado.